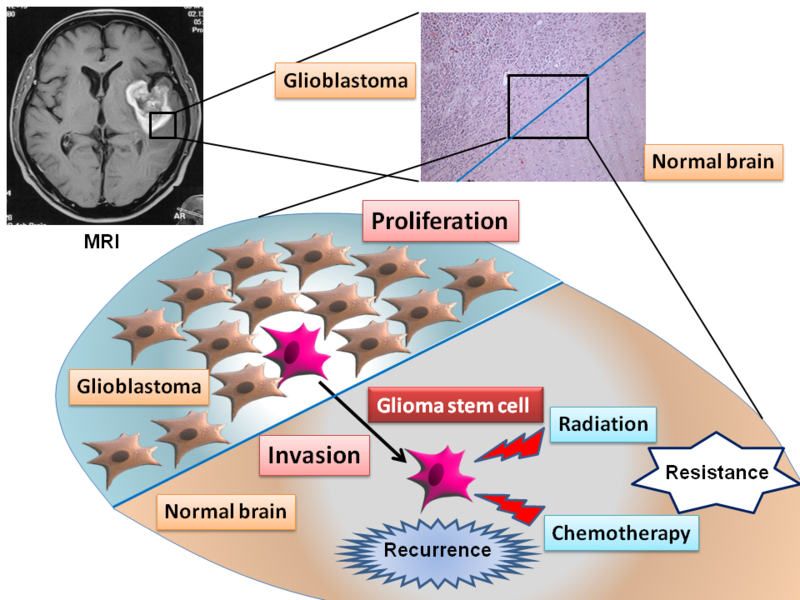 Glioblastoma, which is one of the most intractable tumors in human malignancies, is characterized by the remarkable proliferative activity and the invasive growth to the surrounding normal brain tissue. We recently revealed that inhibition of GSK3β　induces apoptosis and suppresses glioma growth. 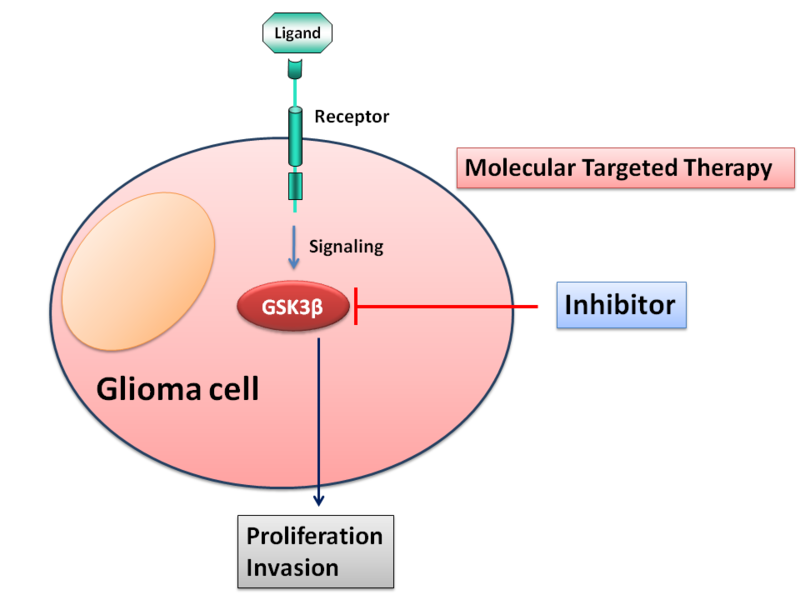 Based on the data from our basic　research, we have started the clinical trial entitled “Phase I/II study using GSK3β inhibitor against recurrent glioblastoma”. We are eager to engage in the translational research using our result of basic research. A characteristic of malignant glioma is their ability to infiltrate and invade the surrounding normal brain tissue. We have identified several molecules which are involved in glioma invasion, such as matrix degrading enzymes (MMP, ADAM and uPA), tyrosine kinases (Eph/ephrin), and intracellular signaling proteins (Rac/Rho). Recently, glioma stem cell has been identified and speculated as the cells which cause the recurrence. We have started to analyze the mechanism of glioma stem cell invasion. The useful biomarkers are needed for the malignant glioma because the early detection of the malignant glioma has a possibility to cure this miserable disease. We focus sphingosine-1-phosphate (S1P) which is a bioactive lipid that signals through a family of G protein-coupled receptors consisting of 5 members termed S1P1–5. S1P regulates cellular proliferation, migration, and survival. We recently reported that downregulation of S1P1 expression increases proliferative activity, and thus, enhances the malignancy of glioblastomas, resulting in a poor survival. Our results suggest S1P1 might be a useful biomarker for the malignant glioma.